UPPER WEST SIDE — Searching for female action heroes in toy stores and comic-book shops yields very little, and what does turn up are such hyper-sexualized heroines as "Wonder Woman," designed with impossibly slim waists and oversized busts. Two local moms are on a mission to fill the void with a new series of figures geared towards empowering girls. 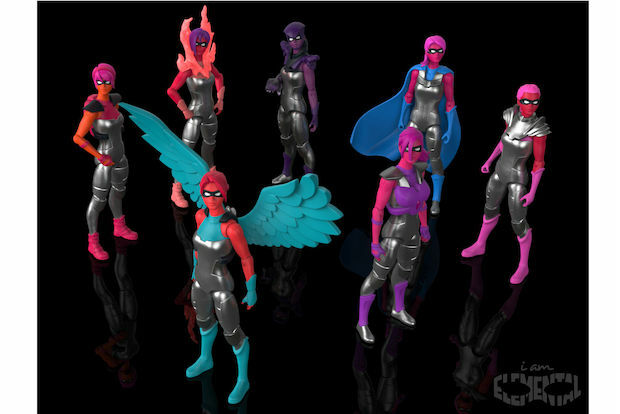 Dawn Nadeau and Julie Kerwin are producing a line of "fierce" female action figures called "IAmElemental" that will hit stores and online markets in December, they said. Unlike traditional male superheroes, who have physical powers like shooting beams from their eyes or flying, the IAmElemental figures have character-driven powers, including "bravery," "honesty," "persistence" and "industry." These forces are meant to inspire girls to think about their own inner strengths, the mothers said. The first series of seven figures revolves around the theme of "courage" and is inspired by Joan of Arc, who kids can learn about as part of the action figure's backstory. More figures and themes, including corresponding real-life inspirational women, will slowly roll out over time, they said. Eventually, they'll all share a save-the-world storyline that also includes graphic novels and comic books, the mothers added. Boldly colored with realistic proportions, the IAmElemental figures are "more heroine, less hooters," according to Nadeau and Kerwin. The pair said they were shocked by the large breasts and tiny waists on typical female action figures. And the problem with Barbie is that "she’s on her tip toes. She doesn’t bend. She doesn’t move," Kerwin said . The IAmElemental figures are ready for action and imaginative play that revolves around movement, with nine points of articulation, she said. Despite their problems with the existing toy landscape, the women are quick to clarify that they're "not anti-doll" or "anti-princess." It bothered them, though, that most toy sets with figurines feature women being saved by knights, with none of the knights ever being female. The storylines are prescribed and women are rarely at the center of the action or saving the day, they said. One of their taglines is: "If you give a girl a different toy, she will tell a different story." The two moms, both graduates of Wellesley College, met while taking their toddlers to a music class and learned they lived on the same block in Lincoln Square. The concept of creating a different set of action figure for their children has been developing over time, hashed out over playdates, park trips and coffee dates. Both of their apartments function as company headquarters. The idea for IAmElemental was first sparked five years ago when Nadeau's daughter, then 3, wanted a toy spaceship after developing an interest in space. Nadeau looked far and wide for a female astronaut to go with the ship, but could only find male astronaut figures. She asked Kerwin to hunt for one, but she also came up short. "There was a true gap in the market," Nadeau said. So they asked themselves, "Am I going to be the one to fill it, or am I going to be the one to make noise about it?" In 2013, they teamed up with the design and product developer Eleventyplex, and the figures began to take shape. They launched a Kickstarter campaign in May, and the results blew them away. The fundraising effort, which runs through June 12, has already garnered $84,998, well above their initial $35,000 goal. Support came from interested parents and — to their surprise — action-figure collectors, who saw they were serious about making top-notch figures, they said. "The collectors appreciate the design and the aesthetic," Nadeau said. Most of the funding will go towards creating several molds for the 4-inch figures, which cost thousands of dollars each, they said. For the next few years, any money made will be funneled back into the company to fuel future endeavors, including 6-inch figures, they said. The figures come in single packs that will be sold for less than $10. A pack of all seven figures and additional accessories will run $65, they noted. The pair has gotten verbal agreement from the owner of the 72nd Street Stationery and Card store between Broadway and Columbus to sell the figures in December when the first batch arrives, the moms said. They're hoping to sign on even more local stores. And if parents think the figures, which are for ages 4 and up, are aimed only at girls, Kerwin pointed to her 8-year-old son, who's told her, "I want to collect them all."